(free-range) … I have worked on having her roam my home (rather than her being in her kennel, which she is generally good with) when I’m away. I also leave the television on (Comedy Central). This has been for the past two days. So far, Bella is doing okay (e.g., no accidents, no obvious furniture jumping-on), at least for up to four hours. (walking) … I walk more. She pees and poops. That’s our tacit contract. (booty scooting) … I now know what this really means. I know there is a word to what I saw her do yesterday. (home office) … I have learned I need a break from my home office. (away home office) … I brought Bella to one of my home office away from home office spots – Niles Pie Company (website, Instagram, Facebook, Twitter). This is where I learned about her barking choices – at people and at noises. Fascinating, Ms. Bella. (stretching) … I play a little game with myself – I stretch when she stretches, because she stretches big time and often – in the house, during walks, on the porch, wherever. She also sleeps often, but I don’t because I have bills to pay, and I’m not a 10-year-old dog. (little road trips) … I learned she’s cool with car rides. Turns out, Bella will get into a car pronto – evening or daytime (if time of day even matters). And she pretty much looks the same. After the away home office jaunt, she was not a fan of getting out of the car (is how I interpreted her dog body language). 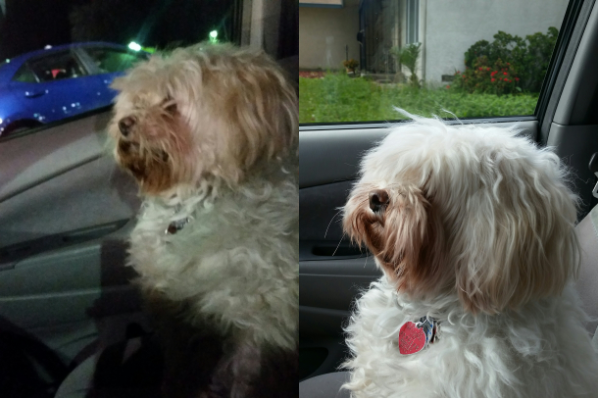 (drive-thru) … I survived her high-pitched barking as she leaned over to bark at the order-taker, money-taker, and food-giver persons (and other hoomans that the food-giver called over to see how cute Bella is). (burr) … I learned burrs can get into her paws. While burrs weren’t buried deep in her paw, it was enough for me to have Katie, at Petco, take ’em out via shaving two of her paws. And meanwhile, I continue to de-burr the best I can her after each walk. (Day 9) Free-range fun is freeing both of us. It was lovely to have Bella at Niles Pie, and I think she did just fine! Woof!